401110 FOPX 605 ALFA LAVAL FOPX605 Separation System Full Set Manuals: Separator FOPX 605TFD-20 Manual (incl. fault finding), Spare Parts Catalogue, Operating Instructions, System Description, Parameter List, Alarms and Fault Finding, System Reference, Installation Instructions, Safety, Component Descriptions with fault finding (Control Unit, Pumps, Solenoid & Regulating Valves, Transducer, Pressure Switches, Indicators, Flexible Connections etc.) . 401111 FOPX 609 ALFA LAVAL FOPX609 Separation System Full Set Manuals: Separator FOPX 609TFD-24 Manual (incl. fault finding), Spare Parts Catalogue, Operating Instructions, System Description, Parameter List, Alarms and Fault Finding, System Reference, Installation Instructions, Safety, Component Descriptions with fault finding (Control Unit, Pumps, Solenoid & Regulating Valves, Transducer, Pressure Switches, Indicators, Flexible Connections etc.) . 401112 FOPX 610 ALFA LAVAL FOPX610 Separation System Full Set Manuals: Separator FOPX 610TFD-24 Manual (incl. fault finding), Spare Parts Catalogue, Operating Instructions, System Description, Parameter List, Alarms and Fault Finding, System Reference, Installation Instructions, Safety, Component Descriptions with fault finding (Control Unit, Pumps, Solenoid & Regulating Valves, Transducer, Pressure Switches, Indicators, Flexible Connections etc.) . 401113 FOPX 611 ALFA LAVAL FOPX611 Separation System Full Set Manuals: Separator FOPX 611TFD-20 Manual (incl. fault finding), Spare Parts Catalogue, Operating Instructions, System Description, Parameter List, Alarms and Fault Finding, System Reference, Installation Instructions, Safety, Component Descriptions with fault finding (Control Unit, Pumps, Solenoid & Regulating Valves, Transducer, Pressure Switches, Indicators, Flexible Connections etc.) . 401114 FOPX 613 ALFA LAVAL FOPX613 Separation System Full Set Manuals: Separator FOPX 613TFD-20 Manual (incl. fault finding), Spare Parts Catalogue, Operating Instructions, System Description, Parameter List, Alarms and Fault Finding, System Reference, Installation Instructions, Safety, Component Descriptions with fault finding (Control Unit, Pumps, Solenoid & Regulating Valves, Transducer, Pressure Switches, Indicators, Flexible Connections etc.) . 401115 FOPX 614 ALFA LAVAL FOPX614 Separation System Full Set Manuals: Separator FOPX 614TFD-20 Manual (incl. fault finding), Spare Parts Catalogue, Operating Instructions, System Description, Parameter List, Alarms and Fault Finding, System Reference, Installation Instructions, Safety, Component Descriptions with fault finding (Control Unit, Pumps, Solenoid & Regulating Valves, Transducer, Pressure Switches, Indicators, Flexible Connections etc.) . 401120 MFPX 307 ALFA LAVAL MFPX307 Separation System Full Set Manuals: Separator MFPX 307TFD-21 Manual (incl. fault finding), Spare Parts Catalogue, Operating Instructions, System Description, Parameter List, Alarms and Fault Finding, System Reference, Installation Instructions, Safety, Component Descriptions with fault finding (Control Unit, Pumps, Solenoid & Regulating Valves, Transducer, Pressure Switches, Indicators, Flexible Connections etc.) . 401130 LOPX 705 ALFA LAVAL LOPX705 Separation System Full Set Manuals: Separator LOPX 705SFD-30 Manual (incl. fault finding), Spare Parts Catalogue, Operating Instructions, System Description, Parameter List, Alarms and Fault Finding, System Reference, Installation Instructions, Safety, Component Descriptions with fault finding (Control Unit, Pumps, Solenoid & Regulating Valves, Transducer, Pressure Switches, Indicators, Flexible Connections etc.) . 401131 LOPX 707 ALFA LAVAL LOPX707 Separation System Full Set Manuals: Separator LOPX 707SFD-34 Manual (incl. fault finding), Spare Parts Catalogue, Operating Instructions, System Description, Parameter List, Alarms and Fault Finding, System Reference, Installation Instructions, Safety, Component Descriptions with fault finding (Control Unit, Pumps, Solenoid & Regulating Valves, Transducer, Pressure Switches, Indicators, Flexible Connections etc.) . 401132 LOPX 709 ALFA LAVAL LOPX709 Separation System Full Set Manuals: Separator LOPX 709SFD-34 Manual (incl. fault finding), Spare Parts Catalogue, Operating Instructions, System Description, Parameter List, Alarms and Fault Finding, System Reference, Installation Instructions, Safety, Component Descriptions with fault finding (Control Unit, Pumps, Solenoid & Regulating Valves, Transducer, Pressure Switches, Indicators, Flexible Connections etc.) . 401133 LOPX 710 ALFA LAVAL LOPX710 Separation System Full Set Manuals: Separator LOPX 710SFD-34 Manual (incl. fault finding), Spare Parts Catalogue, Operating Instructions, System Description, Parameter List, Alarms and Fault Finding, System Reference, Installation Instructions, Safety, Component Descriptions with fault finding (Control Unit, Pumps, Solenoid & Regulating Valves, Transducer, Pressure Switches, Indicators, Flexible Connections etc.) . 401134 LOPX 713 ALFA LAVAL LOPX713 Separation System Full Set Manuals: Separator LOPX 713SFD-34 Manual (incl. fault finding), Spare Parts Catalogue, Operating Instructions, System Description, Parameter List, Alarms and Fault Finding, System Reference, Installation Instructions, Safety, Component Descriptions with fault finding (Control Unit, Pumps, Solenoid & Regulating Valves, Transducer, Pressure Switches, Indicators, Flexible Connections etc.) . 401135 LOPX 714 ALFA LAVAL LOPX714 Separation System Full Set Manuals: Separator Manual LOPX 714SFD-34 (incl. fault finding), Spare Parts Catalogue, Operating Instructions, System Description, Parameter List, Alarms and Fault Finding, System Reference, Installation Instructions, Safety, Component Descriptions with fault finding (Control Unit, Pumps, Solenoid & Regulating Valves, Transducer, Pressure Switches, Indicators, Flexible Connections etc.) . 401140 MOPX 205 ALFA LAVAL MOPX205 Separation System Full Set Manuals: Separator MOPX 205TGT-24 Manual (incl. fault finding), Spare Parts Catalogue, Operating Instructions, System Description, Parameter List, Alarms and Fault Finding, System Reference, Installation Instructions, Safety, Component Descriptions with fault finding (Control Unit, Pumps, Solenoid & Regulating Valves, Transducer, Pressure Switches, Indicators, Flexible Connections etc.) . 401141 MOPX 207 ALFA LAVAL MOPX207 Separation System Full Set Manuals: Separator MOPX 207SGT-24 Manual (incl. fault finding), Spare Parts Catalogue, Operating Instructions, System Description, Parameter List, Alarms and Fault Finding, System Reference, Installation Instructions, Safety, Component Descriptions with fault finding (Control Unit, Pumps, Solenoid & Regulating Valves, Transducer, Pressure Switches, Indicators, Flexible Connections etc.) . 401142 MOPX 213 ALFA LAVAL MOPX213 Separation System Full Set Manuals: Separator MOPX 213TGT-20 Manual (incl. fault finding), Spare Parts Catalogue, Operating Instructions, System Description, Parameter List, Alarms and Fault Finding, System Reference, Installation Instructions, Safety, Component Descriptions with fault finding (Control Unit, Pumps, Solenoid & Regulating Valves, Transducer, Pressure Switches, Indicators, Flexible Connections etc.) . 401143 MOPX 309 ALFA LAVAL MOPX309 Separation System Full Set Manuals: Separator MOPX 309TGT-24 Manual (incl. fault finding), Spare Parts Catalogue, Operating Instructions, System Description, Parameter List, Alarms and Fault Finding, System Reference, Installation Instructions, Safety, Component Descriptions with fault finding (Control Unit, Pumps, Solenoid & Regulating Valves, Transducer, Pressure Switches, Indicators, Flexible Connections etc.) . 401144 MOPX 310 ALFA LAVAL MOPX310 Separation System Full Set Manuals: Separator Manual MOPX 310TGT-24 (incl. fault finding), Spare Parts Catalogue, Operating Instructions, System Description, Parameter List, Alarms and Fault Finding, System Reference, Installation Instructions, Safety, Component Descriptions with fault finding (Control Unit, Pumps, Solenoid & Regulating Valves, Transducer, Pressure Switches, Indicators, Flexible Connections etc.) . 401150 MMPX 303 ALFA LAVAL MMPX303 Separation System Full Set Manuals: Separator MMPX 303SGP-11 Manual (incl. fault finding), Spare Parts Catalogue, Operating Instructions, System Description, Parameter List, Alarms and Fault Finding, System Reference, Installation Instructions, Safety, Component Descriptions with fault finding (Control Unit, Pumps, Solenoid & Regulating Valves, Transducer, Pressure Switches, Indicators, Flexible Connections etc.) . 401151 MMPX 304 ALFA LAVAL MMPX304 Separation System Full Set Manuals: Separator MMPX 304SGP-11 Manual (incl. fault finding), Spare Parts Catalogue, Operating Instructions, System Description, Parameter List, Alarms and Fault Finding, System Reference, Installation Instructions, Safety, Component Descriptions with fault finding (Control Unit, Pumps, Solenoid & Regulating Valves, Transducer, Pressure Switches, Indicators, Flexible Connections etc.) . 401152 MMPX 403 ALFA LAVAL MMPX 403 Separation System Full Set Manuals: Separator MMPX 403SGP-11 Manual (incl. fault finding), Spare Parts Catalogue, Operating Instructions, System Description, Parameter List, Alarms and Fault Finding, System Reference, Installation Instructions, Safety, Component Descriptions with fault finding (Control Unit, Pumps, Solenoid & Regulating Valves, Transducer, Pressure Switches, Indicators, Flexible Connections etc.) . 401153 MMPX 404 ALFA LAVAL MMPX404 Separation System Full Set Manuals: Separator MMPX 404SGP-11 Manual (incl. fault finding), Spare Parts Catalogue, Operating Instructions, System Description, Parameter List, Alarms and Fault Finding, System Reference, Installation Instructions, Safety, Component Descriptions with fault finding (Control Unit, Pumps, Solenoid & Regulating Valves, Transducer, Pressure Switches, Indicators, Flexible Connections etc.) . 401160 MSPX 303 ALFA LAVAL MSPX303 Separation System Full Set Manuals: Separator MSPX 303TGP-61 Manual (incl. fault finding), Spare Parts Catalogue, Operating Instructions, System Description, Parameter List, Alarms and Fault Finding, System Reference, Installation Instructions, Safety, Component Descriptions with fault finding (Control Unit, Pumps, Solenoid & Regulating Valves, Transducer, Pressure Switches, Indicators, Flexible Connections etc.) . 401170 MIB 303 ALFA LAVAL MIB303 Mobile hydraulic oil cleaning system Full Set Manuals: Separator MIB 303S-13/33 Manual (incl. fault finding), Spare Parts Catalogue, Operating Instructions, System Description, Parameter List, Alarms and Fault Finding, System Reference, Installation Instructions, Safety, Component Descriptions with fault finding (Control Unit, Pumps, Solenoid & Regulating Valves, Transducer, Pressure Switches, Indicators, Flexible Connections etc.) . 401180 MMB 203 ALFA LAVAL MMB203 Separation System Full Set Manuals: Separator MMB203S-13 Manual (incl. fault finding), Spare Parts Catalogue, Operating Instructions, System Description, Parameter List, Alarms and Fault Finding, System Reference, Installation Instructions, Safety, Component Descriptions with fault finding (Control Unit, Pumps, Solenoid & Regulating Valves, Transducer, Pressure Switches, Indicators, Flexible Connections etc.) . 401181 MMB 304 ALFA LAVAL MMB304 Separation System Full Set Manuals: Separator MMB 304S-11 Manual (incl. fault finding), Spare Parts Catalogue, Operating Instructions, System Description, Parameter List, Alarms and Fault Finding, System Reference, Installation Instructions, Safety, Component Descriptions with fault finding (Control Unit, Pumps, Solenoid & Regulating Valves, Transducer, Pressure Switches, Indicators, Flexible Connections etc.) . 401182 MMB 305 ALFA LAVAL MMB305 Separation System Full Set Manuals: Separator MMB 305S-11 Manual (incl. fault finding), Spare Parts Catalogue, Operating Instructions, System Description, Parameter List, Alarms and Fault Finding, System Reference, Installation Instructions, Safety, Component Descriptions with fault finding (Control Unit, Pumps, Solenoid & Regulating Valves, Transducer, Pressure Switches, Indicators, Flexible Connections etc.) . 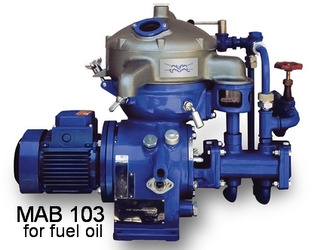 401193 MAB 102, MAB 209 ALFA LAVAL Purifiers Types MAB 102 - 209 - Instruction for Operation and Maintenance. RUSSIAN LANGUAGE. Free Download. 401194 MAB102, MAB209 ALFA LAVAL Purifiers Types MAB 102 - 209 - Instruction for Operation and Maintenance. RUSSIAN LANGUAGE. Free Download. 401200 MAPX 207 ALFA LAVAL MAPX207 Separator Technical Instruction with Spare Parts. 401210 MAPX 309 ALFA LAVAL MAPX309 Separator. Technical Instruction with Spare Parts. 401250 PU 100 ALFA LAVAL Purifier Unit PU100 Separator Full Set manuals: Operating Instructions, Service Manual, Spare parts catalogue, System Description, Parameter List, Alarms and Fault Finding, System Reference / Installation Instructions. 401251 PU 150 ALFA LAVAL Purifier Unit PU150 Separator Full Set manuals: Operating Instructions, Service Manual, Spare parts catalogue, System Description, Parameter List, Alarms and Fault Finding, System Reference / Installation Instructions. 401260 SA 811 ALFA LAVAL Separation System SA811: S 811 Separator Manual, Spare parts catalog. Bonus: SA Separation System-Operating instructions, SA Separation System-System description, SA / PA Separation System Service manual, Separation Unit-Alarms and Fault Finding, S-type Separation System Parameter list, SA 811 Installation system reference, Mounting drawing, SA-type Separation System-Safety. 401261 SA 816 ALFA LAVAL Separation System SA816: S 816 Separator Manual, Spare parts catalog. SA 816 Separation System Ancillary Equipment spare parts catalog. Bonus: SA Separation System-Operating instructions, SA Separation System-System description, SA / PA Separation System Service manual, Separation Unit-Alarms and Fault Finding, S-type Separation System Parameter list, SA 811 Installation system reference, Mounting drawing, SA-type Separation System-Safety. 401262 SA 821 ALFA LAVAL Separation System SA821: S 821 Separator Manual, Spare parts catalog. Bonus: SA Separation System-Operating instructions, SA Separation System-System description, SA / PA Separation System Service manual, Separation Unit-Alarms and Fault Finding, S-type Separation System Parameter list, SA 811 Installation system reference, Mounting drawing, SA-type Separation System-Safety. 401263 SA 826 ALFA LAVAL Separation System SA826: S 826 Separator Manual, Spare parts catalog. SA 826 Separation System Ancillary Equipment spare parts catalog. Bonus: SA Separation System-Operating instructions, SA Separation System-System description, SA / PA Separation System Service manual, Separation Unit-Alarms and Fault Finding, S-type Separation System Parameter list, SA 811 Installation system reference, Mounting drawing, SA-type Separation System-Safety. 401264 SA 835 ALFA LAVAL Separation System SA835 full set manuals: Safety, System Description, Operating Instructions, Parameter List, Alarms and Fault Finding, Installation System Reference, Service Manual, Spare Parts Catalogue. 401265 SA 871 ALFA LAVAL Separation System SA871 Final drawings. 401270 SU 300 ALFA LAVAL Purifier Unit SU300 Separator Full Set manuals: Operating Instructions, Service Manual, Spare parts catalogue, System Description, Parameter List, Alarms and Fault Finding, System Reference / Installation Instructions. 401271 SU 400 ALFA LAVAL Purifier Unit SU400 Separator Full Set manuals: Operating Instructions, Service Manual, Spare parts catalogue, System Description, Parameter List, Alarms and Fault Finding, System Reference / Installation Instructions. 401272 SU 500 ALFA LAVAL Purifier Unit SU500 Separator Full Set manuals: Operating Instructions, Service Manual, Spare parts catalogue, System Description, Parameter List, Alarms and Fault Finding, System Reference / Installation Instructions. 401273 SU 600 ALFA LAVAL Purifier Unit SU600 Separator Full Set manuals: Operating Instructions, Service Manual, Spare parts catalogue, System Description, Parameter List, Alarms and Fault Finding, System Reference / Installation Instructions. 401274 SU 700 ALFA LAVAL Purifier Unit SU700 Separator Full Set manuals: Operating Instructions, Service Manual, Spare parts catalogue, System Description, Parameter List, Alarms and Fault Finding, System Reference / Installation Instructions. 401275 SU 811 ALFA LAVAL Separation Unit SU811: Separator S 811 Spare parts catalog, S811 Separator Manual. Bonuses: S811, S816, S821, S826 Single Flex Module Installation System Reference. S and P Flex Separation Operating Instructions. S Flex Separation System Description. S flex separation Alarms and Fault Findings. S-type Separation System Parameter list. S-type Separation system Safety. 401276 SU 816 ALFA LAVAL Separation Unit SU816: Separator S 816 Spare parts catalog, Separator S816 Manual, Separation Unit SU816 Ancillary Equipment Spare parts catalog. Bonuses: S811, S816, S821, S826 Single Flex Module Installation System Reference. S and P Flex Separation Operating Instructions. S Flex Separation System Description. S flex separation Alarms and Fault Findings. S-type Separation System Parameter list. S-type Separation system Safety. 401277 SU 821 ALFA LAVAL Separation Unit SU821: Separator S 821 Spare parts catalog, S821 Separator Manual, Separation Unit SU 821 Ancillary Equipment Spare parts catalog. Bonuses: S811, S816, S821, S826 Single Flex Module Installation System Reference. S and P Flex Separation Operating Instructions. S Flex Separation System Description. S flex separation Alarms and Fault Findings. S-type Separation System Parameter list. S-type Separation system Safety. 401278 SU 826 ALFA LAVAL Separation Unit SU826: Separator S 826 Spare parts catalog, S826 Separator Manual, Separation Unit SU 826 Ancillary Equipment Spare parts catalog. Bonuses: S811, S816, S821, S826 Single Flex Module Installation System Reference. S and P Flex Separation Operating Instructions. S Flex Separation System Description. S flex separation Alarms and Fault Findings. S-type Separation System Parameter list. S-type Separation system Safety. 401280 SU 831 ALFA LAVAL Separation Unit SU831: Separator S 831 Spare parts catalog, Separation Unit SU 831 Ancillary Equipment Spare parts catalog. Separation Unit831 & 841 Installation System Reference. Bonuses: Separation Unit 831/836/841/846 Installation System Reference. S and P Flex Separation Operating Instructions. S Flex Separation System Description. S flex separation Alarms and Fault Findings. S-type Separation System Parameter list. S-type Separation system Safety. 401281 SU 835 ALFA LAVAL Separation Unit SU835: Separation Unit SU 835 (Separator & Ancillary Equipment) Spare parts catalog. Bonuses: S and P Flex Separation Operating Instructions. S Flex Separation System Description. S flex separation Alarms and Fault Findings. S-type Separation System Parameter list. S-type Separation system Safety. 401282 SU 836 ALFA LAVAL Separation Unit SU836: Separator S 836 Spare parts catalog, Separation Unit SU 836 Ancillary Equipment Spare parts catalog. Bonuses: Separation Unit 831/836/841/846 Installation System Reference. S and P Flex Separation Operating Instructions. S Flex Separation System Description. S flex separation Alarms and Fault Findings. S-type Separation System Parameter list. S-type Separation system Safety. 401283 SU 840 ALFA LAVAL Separation Unit SU840: Separation Unit SU 840 (Separator and Ancillary Equipment) Spare parts catalog. Installation system reference. Service Manual. Bonuses: Separation Unit 831/836/841/846 Installation System Reference. S and P Flex Separation Operating Instructions. S Flex Separation System Description. S flex separation Alarms and Fault Findings. S-type Separation System Parameter list. S-type Separation system Safety. 401284 SU 841 ALFA LAVAL Separation System SU841: Separator S 841 Spare parts catalog, Separation Unit SU 841 Ancillary Equipment Spare parts catalog. Separation Unit831 & 841 Installation System Reference. Bonuses: Separation Unit 831/836/841/846 Installation System Reference. S and P Flex Separation Operating Instructions. S Flex Separation System Description. S flex separation Alarms and Fault Findings. S-type Separation System Parameter list. S-type Separation system Safety. 401285 SU 846 ALFA LAVAL Separation System SU846: Separator S 846 Spare parts catalog, S846 Separator manual, Separation Unit SU 846 Ancillary Equipment Spare parts catalog. Bonuses: Separation Unit 831/836/841/846 Installation System Reference. S and P Flex Separation Operating Instructions. S Flex Separation System Description. S flex separation Alarms and Fault Findings. S-type Separation System Parameter list. S-type Separation system Safety. 401286 SU 855 ALFA LAVAL Separation System SU855: Separation Unit SU 855 (Separator and Ancillary Equipment) Spare parts catalog. Bonuses: S and P Flex Separation Operating Instructions. S Flex Separation System Description. S flex separation Alarms and Fault Findings. S-type Separation System Parameter list. S-type Separation system Safety. 401287 SU 865 ALFA LAVAL Separation System SU865 Full Set manuals: Operating Instructions, Service Manual, Spare parts catalogue, System Description, Parameter List, Alarms and Fault Finding, System Reference / Installation Instructions. 401290 FCM 1000, FCM 2000 ALFA LAVAL Fuel Conditioning Module FCM 1000, FCM 2000 - Description, Operation, Installation, Service Manual & Spare Parts List. Separator Manuals and Parts Catalogs Video Presentation.